1. Stock market overview: The weekend is just around the corner but that's clearly not enough to cheer stock market investors. All the major indexes are in the red. 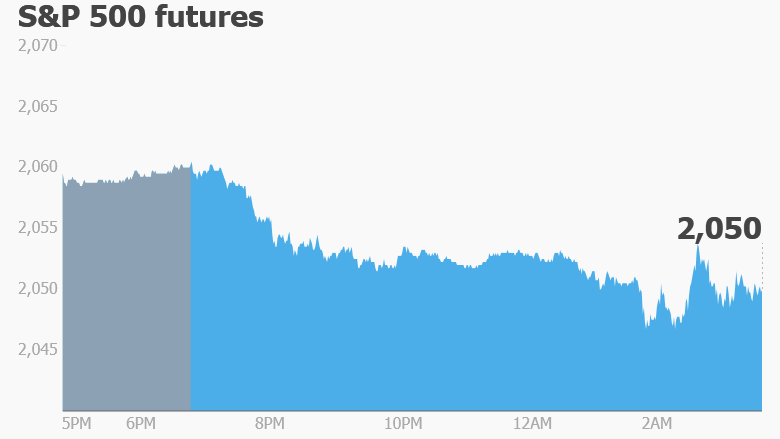 U.S. stock futures are down, European markets are sliding in early trading and Asian markets all closed the week with losses. However, the moves aren't dramatic. Most indexes are falling by about 0.5%. 2. Market movers -- Allergan, Nordstrom: Shares in Allergan (AGN) are falling in premarket trading. The drug maker has had a difficult year and shares have already crashed by over 30% since the start of January. In April, Pfizer (PFE) called off a massive $150 billion merger with Allergan after the Obama administration issued rules designed to crack down on some mergers. Investors may be selling Allergan Friday as they speculate European drug maker Bayer (BAYRY) won't step in with a bid for the firm. Reports came out on Thursday that Bayer may make a bid for Monsanto (MON). Bayer declined to comment. In the retail world, investors may be disappointed with Nordstrom's (JWN) latest earnings, which came in below analyst expectations. 3. Earnings: Friday tends to be a slow day for the release of quarterly results, but that's not the case today. Brookfield Asset Management (BAM), Honda (HMC), JCPenney (JCP) and the soccer club Manchester United (MANU) are all reporting results ahead of the opening bell. 4. Economics: Economists have got their hands full on Friday. The eurozone economy grew 1.5% in the first quarter compared to the same period in the previous year. That's slightly below the preliminary estimate of 1.6% growth. The International Monetary Fund just released a report about the U.K. economy, noting that it's suffering a slowdown ahead of a June vote on whether the country should leave the European Union. The head of the Bank of England said on Thursday that leaving the EU could push the economy into a recession. OPEC -- a group of some of the biggest oil exporting nations in the world -- is releasing its monthly oil market report at 7:35 a.m. ET. This comes as oil prices have recovered from record-setting lows over the past few months. In the U.S., the Census Bureau is reporting national retail sales data for April at 8:30 a.m. And the University of Michigan is releasing its Consumer Sentiment Survey for April at 10 a.m.